In the Spring 2016 issue, Dr. Foster reviewed tradeoffs between maintaining suppression (control) of sea lamprey in the Great Lakes and alleviating its impacts on non-target organisms, suggesting the time had come to consider allowing sea lamprey to “reach a point of natural equilibrium.” Dr. Foster’s suggestion to experiment with the Great Lakes fishery should not be considered, as allowing sea lamprey populations to expand uncontrolled is likely to cause major ecological and economic harm. The reality is, sea lampreys and some of the most important Great Lakes fishes cannot co-exist, as much as this idea is appealing. I will discuss two aspects of this issue, one the “equilibrium” concept and the other the tradeoffs problem. First, could an acceptable equilibrium be achieved between sea lamprey and Great Lakes fishes in the absence of sea lamprey control? The short answer is “no.” The insurmountable hurdle here is the sea lamprey’s ability to reproduce in massive numbers. As the number of host fish, like lake trout and whitefish, decline from predation, the initial population of parasites does decline in response to reduced feeding opportunities. Unfortunately, even as parasitic lamprey decline in abundance, the migration of young lamprey from streams—where they rear—declines but little, resulting in continuing declines in host populations. This unresponsiveness results from the high reproductive rate of sea lampreys (the average female sea lamprey lays 100,000 eggs, so few are needed to repopulate), among other factors. The envisioned equilibrium without sea lamprey control likely will look much like the situation before sea lamprey control, an ecological disaster. The weak ecological feedback between the number of parasitic lampreys and their young became apparent early after the sea lamprey invaded the upper Great Lakes. 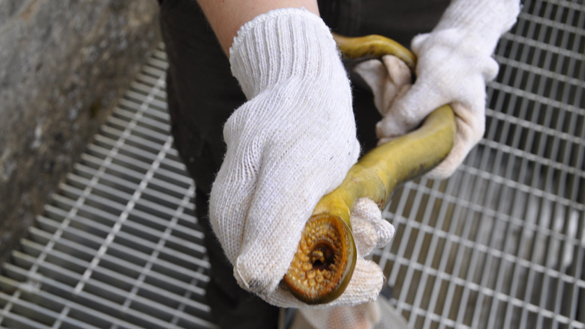 The founding populations of sea lamprey in Lakes Michigan and Huron, known to be miniscule, reached pest levels of abundance within only two generations—a remarkable feat. No equilibrium was achieved—the lake trout, which was overfished, disappeared and the lake whitefish population remained low. Further, delays in extending suppression efforts to Lake Huron in the 1960s resulted in a fish community so barren of prey for parasitic lamprey that the breeding population collapsed on its own. Then, as soon as deepwater ciscoes, a missing host for parasitic lamprey, began a recovery in the early 1970s, sea lamprey predation rebounded immediately. Lamprey reproduction had remained undiminished despite a paucity of breeders. Until ciscoes recovered, most of the parasitic lamprey must have perished for lack of suitable hosts, creating an illusion of an accommodation between predator and prey. Dr. Foster correctly identified several undesired impacts on non-target species resulting from sea lamprey control. The question is, do the ecological benefits from control justify these unintended impacts—can one species be traded off against another? From a biodiversity standpoint, some species or populations within species (ecologically significant units) can be viewed as requiring more protection than others. Those of special significance may be listed, endemic, evolutionarily important, or functionally essential. In the deep-water habitats of the Great Lakes, these categories all converge around one species, lake trout, which by happenstance is the fish requiring the highest level of sea lamprey suppression. The demise of lake trout, caused by overfishing and predation by sea lamprey, triggered biological collapses that, depending on the lake, resulted in the elimination of whole taxa and the proliferation of destructive exotic species. The eliminated taxa were endemics, formerly wide-ranging members of each lake’s deepwater cisco complex. Lake Superior’s species assemblage held on better than those in the other lakes, but even so the formerly dominant member of this assemblage, the shortjaw cisco, has been designated as threatened by the Government of Canada. The impacts of sea lamprey control on the northern brook lamprey, a native species, are especially problematic in that, in Canada, it is designated a species of Special Concern (noted by Dr. Foster). Nonetheless, it is much more widely distributed than the remaining forms of deepwater ciscoes, some of which would likely be casualties of halting sea lamprey control. More effort could be allocated to assessing the distribution of northern brook lamprey in the basin, along with establishing whether, in fact, it is a distinct species separate from the silver lamprey, an issue that remains unresolved. In any event its status, like that of the stone cat, a native member of the catfish family, seems well short of a justification for unleashing a second biological collapse in the Great Lakes. The largest populations of northern brook lamprey occur above dams in waters not treated with lampricides. Removal of such dams and extending lampricide treatments above them would be disastrous for northern brook lamprey. Clearly, a need exists to improve connectivity between dammed rivers and the Great Lakes. Research into how to stop upstream passage of the sea lamprey and other destructive species in rivers while allowing desirable species to migrate is currently a high priority; a major new source of funding for this research was recently announced. A strong focus on creating connectivity while still blocking undesirable invaders like sea lamprey, will be challenging, but it has the potential to achieve what Dr. Foster wants. I started my career working on Lake Huron nearly five decades ago, when the sea lamprey had the upper hand, and cannot now comprehend any action that would jeopardize what has taken so long to achieve.